Charlie Jones and Delante Jones spoke after American's 62-56 loss to Maryland to begin the season. Full video above and selected quotes below. The fellas break down Delante's heroic game-winner vs. Holy Cross and dissect Patriot League Tournament scenarios before being joined by Eagles all-time great and 3-point shooting contest record-holder Andre Ingram to discuss his professional career and his four years at AU laying the foundation for the Eagles' back to back Patriot League championships. 39-47:45 — Patriot League talk. Can Bucknell hold on? 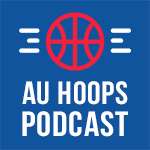 47:45: Closing thoughts (high school hoops and who Kobe's Tweeting about).